" Vedant is a unique 7 & 8 string guitarist, drummer and producer from Auckland New Zealand "
Vedant is a unique 7 & 8 string guitarist, drummer and producer from Auckland New Zealand. He first started playing music when he was 4 years old on violin, followed by 3 years of keyboard lessons from when he was 7. Vedant started playing electric guitar when he was 10 and since then he has been determined to become a professional musician. He has won many school solo music competitions in the strings category, has come 1st in his school talent quest and currently plays drums and guitar In his High School Big Band and Senior Jazz Combo, both groups have won many awards. 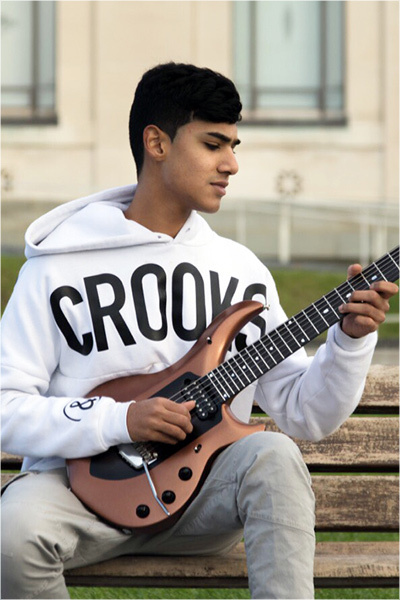 Vedant was the 2nd highest ranked electric guitarist and came 5th overall at the mercury bay young guitarist award festival in 2016 which featured many guitarists aged 16-25 from all over New Zealand. 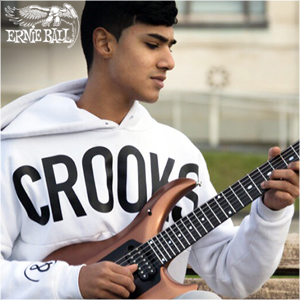 Vedant achieved distinction in Trinity Grade 8 Electric Guitar and Drums and is into his second year teaching the two instruments part time. His favourite guitarists include: Tosin Abasi, Plini, Guthrie Govan, Jason Richardson, Larry Carlton, Sithu Aye and Slash. Vedant Is also into a wide variety of electronic music including artists such as Squarepusher, The Algorithm, Aphex Twin, Cause & Affect and Graphyt. Vedant has been using Ableton Live 9 and Logic Pro X to produce music for 3 years and is currently working on a solo EP set to come out later on this year in which he aims to combine the expressive Harmonies of Jazz, the intricate polyrhythms and odd time signature patterns of found in Prog Metal and the incredible range of electronic sounds and audio effects used by contemporary Dubstep, Trap and House producers in order to create a pathway for a new generation of guitar fused music. Check out Vedant’s facebook and guitar instagram to hear more.